If you ever think about doing one of these four repairs yourself, stop what you are doing and call a pro. 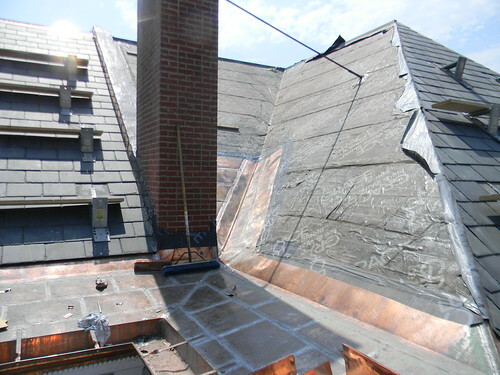 From the ground, your roof probably doesn’t look that difficult to repair. Once you get up there, though, you gain a new perspective. Hopefully, you let that perspective tell you to go back inside and call someone with experience. Roofing is a dangerous job, even for professionals. It only takes one mistake to fall, which usually means broken bones. Even if you have good balance, the force you must exert to pull shingles off your roof can easily send you crashing to the ground. Working on the roof also exposes you to intense heat. Are you sure you can nail down shingles in 190 degree heat? Without getting vertigo and falling off the roof? The physical dangers aside, too many things can go wrong with a roof that hasn’t been repaired properly. If you don’t seal it perfectly, water could leak into your attic and cause mold growth. You may even leave enough room for raccoons or mice to burrow their way in. On the surface, HVAC systems don’t look that complicated. There’s an air conditioning unit, a furnace, a blower, and a bunch of pipes. What’s so difficult about that? It turns out that plenty of things are difficult about that. In fact, you need NATE certified technicians like the professionals at Bruce Thornton Air Conditioning who know how to test each part of the system to decide its efficiency. Even if you manage to get your system working again, you probably didn’t include the maintenance needed to keep it as efficient as possible. That takes a lot of training and experience. An inefficient HVAC can add hundreds of dollars to your utility bills per year. It doesn’t take long before you spend more money on utilities than you would have spent hiring a pro. If your home has modern pipes that easily connect to other pipes and faucets, then you can probably do a fair amount of plumbing repairs on your own. If your home has older, copper pipes, though, you will need a professional. Considering that there are about 1.3 million fires reported in the United States, you should probably avoid this kind of chore. If the professional burns your house to the ground, at least the business’s insurance policy will take care of the bill. Having a strong DIY ethic is a good trait. Sometimes, though, you need to learn how to hand the job over to someone who has more experience. Tagged DIY, home, HVAC, Roof Repairs. Bookmark the permalink.